Knitting Instructions. Knit for Kids. Sure, there are a lot of good quality kid's garments which you can buy. But.... Perhaps you already know that not everything can be bought at the store. Every hand made thing besides its sentimental value holds some positive energy which makes them non standard and special. That's why every family has its own "treasure chest" where they save all those old kid's things which nobody is going to use any more. But for some enigmatic reason from time to time they take them out, touch them and say with pride and fondness: "My granny made it for me..."
From time to time I'll add some new instructions which you can use to make something non standard, that can't be found at the store. Are they not that great all those kid's sweaters, dresses, blankets, and etc. which we buy at the stores? Not at all. Technology became pretty advanced nowadays. It gives us a lot of choices which can satisfy any demanding taste. Let's begin to fill our "treasure chest" with easy to follow knitting instructions. You don't have to follow them step by step. It doesn't matter whether you are going to make some knitting for baby, girl sweater or a scarf for your fashion 10-year old son. Just be creative. They will appreciate it. Sooner or later they will say:"She made it for me". 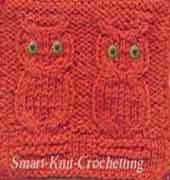 There is no necessity to check this page in order to find some new knitting information and instructions added. Just subscribe to RSS feed (no e-mail necessary). After that all new information presented on this site will be delivered straight to your RSS reader. If you are not sure what RSS and blogging is all about, click on the question mark above the orange sign "RSS" in the left navigation column. Baby Blanket Knit Pattern: Calculations for knitting a blanket. Girl Sweater: Easy to do and a lot of fun. 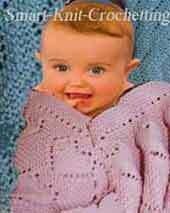 Baby Knitting Pattern: Decorative patterns. Knitting Baby Sweater: How to calculate number of stitches and rows.